When last we covered NAV Coin, they were in the midst of some massive upgrades. Instead of forking their blockchain, however, they decided to start a new one, which recorded the old balances in its genesis block. Despite warnings, exchanges such as Poloniex were slow to switch over, resulting in unprecedented arbitrage opportunities. Many speculators were probably disappointed when the new NAV tokens (tradeable on Bittrex at the time) didn’t rise to Poloniex prices upon upgrade, but the price spiked again at the beginning of August and then tripled in September. So, what’s driving these massive spikes? Since NAV Coin’s most prized attribute is the anonymity it provides, it was likely some players in the dark net who had been following NAV’s development. They caused price explosions in coins like Monero and ZCash, and might be hoping that NAV will earn similar support from dark net markets. Such dark markets still constitute a significant fraction of cryptocurrency transaction volume, and for them, anonymity is key. 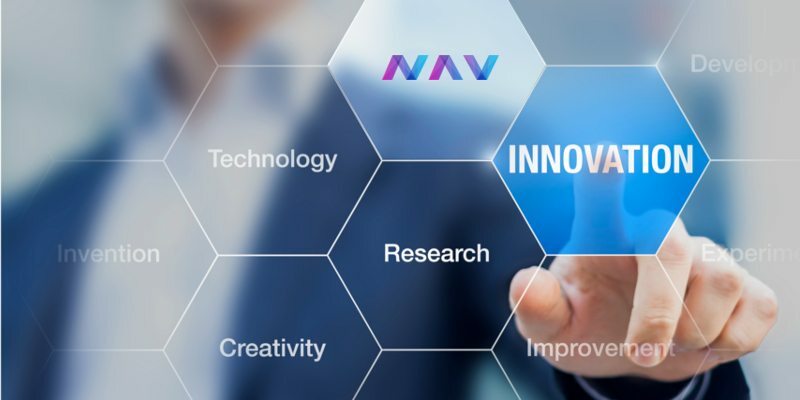 With that in mind—as well as common financial privacy concerns—the NAV team began developing an improved system called NAVTech, releasing the white paper at the end of September. They successfully tested the beta in October, and then announced it would be released November 1st. The launch proved successful, and NAVTech is now up and running. To the user, it looks very simple: just tick the box to “Send NAV Anonymously” and it will do exactly that to the specified address. The only requirement is that you send between 10 and 10,000 NAV coins. Behind the scenes, however, some new innovations are at work. Normally, you send cryptocurrency directly from one person to another, leaving a trail from the sender to the recipient. Although both parties are pseudonymous, this permanent record on the blockchain provides clues that can help to piece together your identity. That’s why the Bitcoin economy has developed “mixers,” which jumble transactions together to obfuscate the flow of coins. Mixers charge considerable fees, however, and require a lot of trust. NAVTech decentralizes the process using clusters of servers, with each server designated for either incoming or outgoing transactions. When you issue an anonymous transaction, you choose an incoming server at random, which provides you with one of many NAV holding addresses to send your coins to. The recipient address is encrypted and sent over to the incoming server. The incoming server then chooses a random outgoing server in the trusted cluster, all of which share a secret passphrase to screen for malicious actors. The outgoing server generates and provides a temporary public key, which the incoming server uses to re-encrypt the recipient address as well as the amount of NAV to send. This encrypted data is then inserted into a secondary blockchain called the Subchain, allowing us to verify everyone’s balances without revealing their identities. Only the outgoing server with the corresponding private key can decrypt the recipient address, but anybody can encrypt another address and compare to see if they match. To obfuscate the flow of funds on the primary blockchain, incoming servers send the anonymized NAV to outgoing servers in bulk every 2 minutes, and the batch is held for one transaction cycle. The outgoing servers issue NAV from the previous transaction cycle to the intended recipients, which means that they receive entirely different coins. The actual process is more complicated, and not necessarily in that order, but you don’t really have to worry about it. You can give NAVTech a try on Windows, OSX, Linux or Android by downloading from here.